Photo: A delicious cheeseburger from the Habit. May 1 – May 7: ‘Me and My Charburger’– when the only thing that matters in this moment is America’s Best Tasting Burger. Share the moment. May 8 – May 14: ‘Start Your Habit Early’– We love our little Habit fans! Snap the cutest picture of your favorite little Charburger lover with their go-to Habit order. 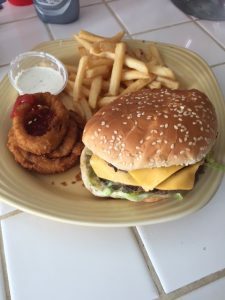 May 15 – May 21: ‘Perfect Pairing’– Who is your Charburger’s BFF? Share your favorite Habit sides with your Charburger. May 22 – May 28: ‘Habit Your Way’ – Custom-built and made-to-order. Show us what makes your Charburger the best in all the land? At the end of each week, one winner will be selected from participants to win a $100 gift card to The Habit. Weekly winners will then be entered into the grand prize contest where fans will vote on their favorite photo during the week of May 29- June 1. The grand prize winner will be awarded a $200 Habit Gift Card and exclusive Habit merchandise. For more information and detailed contest rules on the ‘Charburger Challenge,’ click here. The Habit Burger Grill is a burger-centric, fast casual restaurant concept that specializes in preparing fresh, made-to-order chargrilled burgers and sandwiches featuring USDA choice tri-tip steak, grilled chicken and sushi-grade albacore tuna cooked over an open flame. In addition, it features fresh hand-cut salads and an appealing selection of sides, shakes and malts. The Habit was named the “best tasting burger in America” in July 2014 in a comprehensive survey conducted by one of America’s leading consumer magazines. The first Habit Burger Grill opened in Santa Barbara, California in 1969 and has since grown to more than 175 restaurants in 16 markets throughout California, Arizona, Florida, Idaho, Maryland, Nevada, New Jersey, Utah, Virginia and Washington. More information is available at www.habitburger.com. Self Disclosure: I received a free gift card to feature. Info was provided.